Powered by the groundbreaking Colossal Reels engine and developed by the casino software developer WMS, Epic Monopoly II slot is the perfect marriage between a household brand known the world over and a fan-favourite reel layout. As a result, Epic Monopoly II has 2 reel sets – one is 5 reels and 4 rows and the other is 5 reels and 12 rows offering you a total of 100 paylines. Playable from 50p to £250 a spin, you can play the game on your desktop, mobile or tablet devices. As for the imagery, Mr Monopoly features heavily as well as the dog and the iconic pieces such as the car, top hat and ship. In terms of bonus features, there are 3 in total. 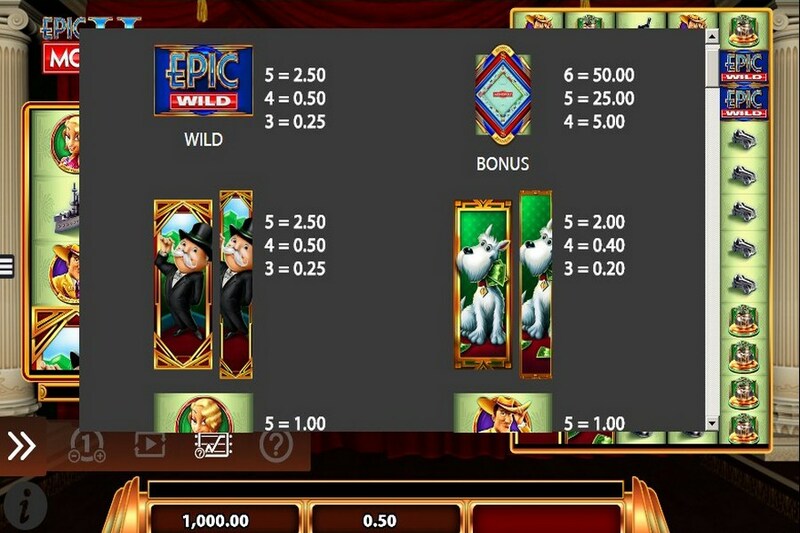 However, in the base game, look out for a reel full of wild symbols (Epic Wild) as it transfers over and takes up the entire corresponding reel on the Colossal Reel set – this can dramatically increase your chances of wins. You have the Wheel Bonus feature which is played when you get 3 or more Bonus scatter symbols on reels 1, 3 and 5 across both reel sets. 4 scatters give you 10 times your stake, 5 scatters give you 50 times your stake whilst 6 gives you 100 times your stake (as well as triggering the feature!). You then spin the wheel where you can win cash prizes up to 10 times your stake, 7, 10 or 20 free spins, 2, 5 or 10 dice rolls for the Around the Board Bonus feature, Chance Bonus and 2x and Spin Again. Once the latter is awarded, it’s replaced by a monetary award of 5 times your stake. The Free Spins Bonus feature can give you between 7 and 20 free spins. As with the base game, a wild stack on the main reel set will transfer over to the Colossal Reel set and turn fully wild. 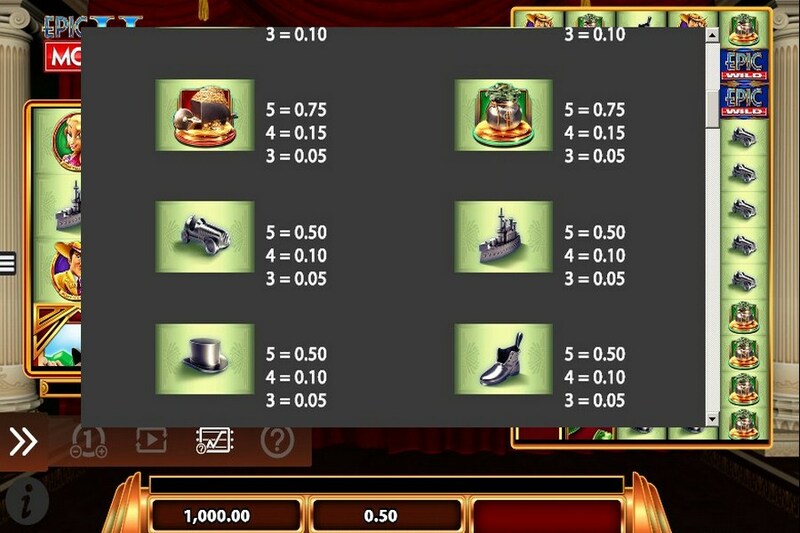 However, getting 3 or more bonus symbols across both reel sets will reward you with more free spins as well as giving you cash prizes of up to 100 times your stake (at the same level of triggering the Wheel Bonus feature). You also get to pick from 5 cards to win a cash prize of up to 10 times your stake, 20 free spins, 10 dice rolls for the Around the Board Bonus feature and 2/3/5x and Pick Again. The Around the Board Bonus feature allows you to travel the iconic Monopoly board by rolling the dice – when Mr Monopoly lands, you will win a prize. There’s many different things to win including cash prizes and pick again. Cash prizes go up to 1,500 times your bet per 2 lines so there’s plenty to win if you’re lucky. The feature ends though when you have no more rolls of the dice. 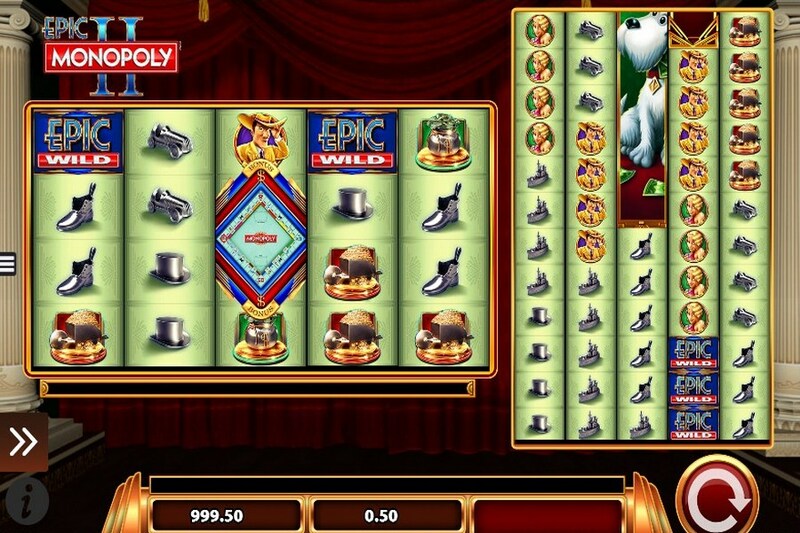 The slot machine game Epic Monopoly II offers you the perfect balance between a popular game engine and a household brand name.